Home Apps How did Waze increase traffic jams? Until about twenty years ago, it was thought that the city traffic conjunctions could be solved by building interchanges or widening roads. Since then enough data has been accumulated that shows that the traffic congestion problem in cities is more dynamic. It is not the number of cars sold, not the number of residents, not the number of routes to the city, and not the quality of public transportation. The main cause of congestion is the willingness of people to stand in traffic. A famous example for it was an incident that occurred in New York. You can read about it in the great book “STREET SMART” by Sam Schwartz (Gridlock Sam). It happened when one of the bridges entering the city was abruptly closed due to a crack on a supporting column. The city’s transportation department almost panicked. Over the next few months, the traffic was supposed to enter NY through fewer lanes. The expected traffic jams were supposed to take hours but, oddly enough, they never happened. Yes, some of the load went to other routes but some of the load had just disappeared. To understand where the urban congestion has gone, you have to understand how people choose to travel and why. The key to this understanding is not distance but a concept I call “hassle-distance“. Think of it this way, suppose you have to buy a table and you have two identical stores to choose from, how would you decide where to go, to the shop on the right or to the shop on the left? The spontaneous answer is “to the nearest one” but that’s not exactly the case. Is there a traffic jam on the way to the right store? is it possible that parking in the left store is further away, or charges you for the parking spot? The considerations whether and where to travel, to achieve what we want depends on the hassle we will agree to “go through” to get the product. “Product” in this sense being, anything that can be offered to a market that might satisfy a want or need. There are products for which we will agree to travel an hour and a half, such as an excellent workplace. There are those for which we will not be willing to take more than a ten minute walk, such as bread or a kindergarten for our children. How much would you be willing to bother for a wedding dress? A Barcelona FC football match? A Shawarma? A carton of cigarettes? A meal in a two Michelin stars restaurant? Meeting a guy you just matched in Tinder? For each of us, for each of these “products” there is a hassle-distance. When the bridge in New York was closed people simply decided that they’d be better off without the hassle of the new traffic and opted to give up on some rides or simply make their purchases elsewhere. Similarly, when we open another lane to Tel Aviv we reduce some of the hassle-distance and more people will be willing to enter the city. 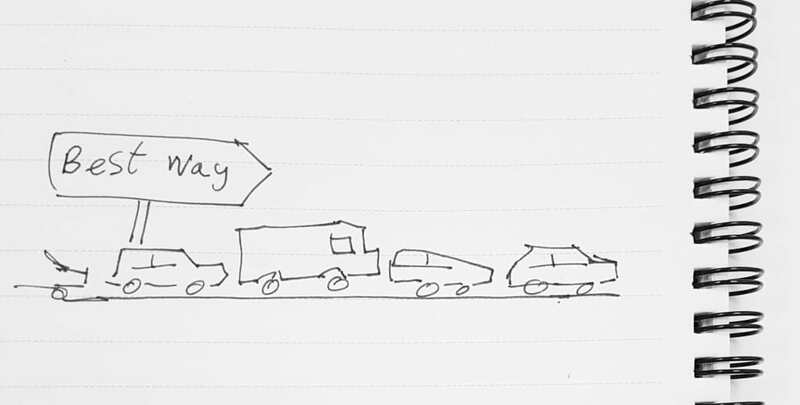 By doing so the traffic jams immediately compensate for that additional lane, hassle-distance goes up again and we are at the same equilibrium we started with. Hassle-distance is an economic concept but it is affected by psychological factors. It depends on the individual person and his preferences, the product he wants to buy and the obstacles he expects – will the ride take a long time? Are there any current traffic jams? How easily will I find a parking space? Is it better to take a cab? Ride the bicycle? And… would I know the way or would I get lost in the city maze of one-way streets? Wait, what? What do you mean “get lost”? There’s Waze is’t there? Exactly. That’s the point. Waze and other GPS navigation tools have removed one of the biggest barriers for driving a private car in the city – how to get there. Here’s thought experiment – let’s say you’ve heard on the news that the global GPS system has collapsed and for the next week you will not be able to navigate using your mobile device at all. How many of your trips will be canceled? How many will you take by bus? By taxi? You got the idea. For many of us, the navigation tools significantly changed the decision whether to drive our private car. It has reduced the hassle-distance of navigation and we are willing to “pay” more hassle for other barriers, such as a traffic jam. Even more so when those same tools promise us that we have taken the best route. Waze is a great when only a small portion of the population uses it, but when everyone uses it, it adds to city congestion and traffic jams at its entrances. Unfortunately this is just the beginning of the revolution in urban transportation. Today’s private car is the most convenient method of transportation. It takes us from the garage under our home directly to the parking lot under our workplace. It goes out when we want to, we do not have to wait for it, it plays the music we prefer, it’s not crowded and it’s so intimate that we even allow ourselves to pick our nose. Yes, it also has disadvantages, the private car is expensive to maintain, costing more per mile of usage. But the biggest drawback it has for many people – The act of driving itself is a hassle. Gas-brake-gas-brake for half an hour on the way to work each morning … I’d rather have someone else do the driving for me. Our perception of driving has changed in recent decades from a source of fun and pleasure to a source stress and anxiety. Driving is now a thing we are trying to avoid. Uber is doing just that for us. It provides most of the comfort of a private car while saving both cost and hassle. And now let’s speculate… once private cars will become autonomous and remove the necessity to pay attention to the road, will it reduce or add traffic rides? When free from the hassle of driving, and given option to take nap or check Facebook or your emails, will people’s willingness to stand in traffic increase or decrease? In fact, we do not even need a 5th generation autonomous car for that. Already 3rd or 4th generations will be able to take us through conjunctions. Blocked and slow traffic is a safe and easy problem to be managed by autonomous car algorithms. Yes, exactly, less hassle while driving is right around the corner. Brace yourself for the huge clogs of 3rd generation autonomous cars.